Improved Engine Performance - PRI-G works chemically within gasoline to improve the combustion process. Improved combustion means improved engine performance. You will realize increased power from your engine. At the same time, you will enjoy greater fuel economy. PRI-G reduces the hesitation, knocking, and pinging that is common in gasoline engines. It is also extremely effective at cutting harmful emissions. Smog tests are no longer a challenge. Reduced Maintenance Costs - PRI-G's proprietary, refinery-grade chemistry is unsurpassed at preventing carbon deposits, and fuel system fouling. Your engine will remain cleaner and last longer, which means maintenance costs are significantly reduced. Keep your car, boat, or RV in great shape for years to come! Keeps Fuel Fresh and Ready To Use - It's a fact: fuel ages quickly! No matter how soon you use the gasoline you buy, it will have aged in your fuel tank by the time you use it; for that reason, you can't afford to be without PRI-G. PRI-G keeps gasoline fresh. In fact, by treating the fuel annually with PRI-G, you can keep it fresh in storage for years! You'll be assured a fast start for you engine next season, or whenever you use it next. Those operating a generator on a periodic basis are especially benefited by PRI-G use - when it comes time to run that generator, it's fuel will be fresh and ready to go! If your fuel has already aged, PRI-G can still help. Tests have shown where PRI-G can restore aged fuel to refinery-fresh conditions. Super Concentrated - PRI-G is super concentrated, with a dose rate of 1:2,000. This means PRI-G is extremely cost effective to use. Get the most out of your gasoline for only pennies a gallon! PRI-G also has a three-year shelf life. Safe To Use - PRI-G's enhanced thermal stability chemistry works within the fuel instead of altering it, which means the product is completely safe to use. Fuel specifications aren't changed, so engine warranties are not voided! PRI-G is safe and effective in both four stroke and two stroke engines. Use PRI-G today to get the most out of your gasoline and your engine. PRI-G Gasoline treatment 16oz Treats 256 gallons of gas. $21.95 each. PRI-G Gasoline treatment 32oz Treats 512 gallons of gas. $32.95 each. 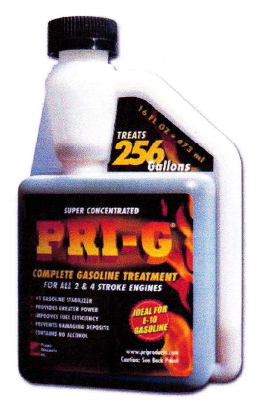 PRI-G Gasoline treatment 32oz bottles. Case of 12. $390.00. PRI-G Gasoline treatment 1 Gallon Treats 2.048 gallons of gas. $88.00 each.